While most people have put away their painted eggs and finished off their remaining chocolate rabbits and jelly beans, we are enthusiastically awaiting our Greek Easter celebration this Sunday. A day steeped in tradition in our family, we are already preparing for the fun feast ahead. To prepare ourselves for our excessive feta consumption, we whip up a light feta dip for some friends. 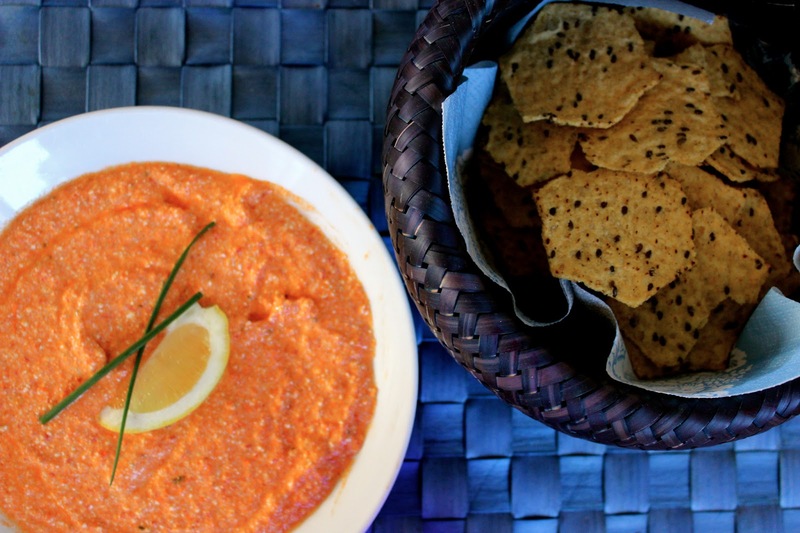 Htipiti is a spread combining the salty cheese with roasted red peppers and spices, kind of like a Greek Romesco Sauce. We love to serve the orangey red blend as a dip with our absolute favorite chips, Food Should Taste Good Multigrain Tortilla Chips or as a spread atop a lamb burger or flatbread. The blend of Mediterranean flavors in every bite triggers our taste buds for the meal ahead. In a food processor, add all the ingredients and pulse until fully blended and smooth. If the mixture is too thick add more EVOO. Plate and serve with pita chips and/or sliced vegetables, we love Food Should Taste Good Multigrain Tortilla Chips. Serves 6-8.